In the ‘International Atlas of AIDS’, the last AIDS atlas to be written and published in 2008, the editors decided to include a chapter on the ‘social repercussions’ of AIDS. Photographs of ACT UP, educational posters, visual art and poems concluded this compendium written for doctors and biomedical researchers. It’s a chapter that has always puzzled me. While AIDS atlases had been published since 1986, they had previously included heartfelt dedications to patients and communities affected by the devastating disease from the authors, but the text’s body was dedicated to the traditional task of a standard medical atlas: to show the clinical, epidemiological and microbiological appearances of AIDS. It was acknowledged that the sexual politics of the AIDS crisis, the ‘epidemic of signification’, and any evaluation of political shortcomings were better suited to other forums. That was until 2008, when Donna Mildvan and her colleagues decided that precisely those aspects of AIDS, which exceeded the biomedical scope of the publication, could no longer be ignored and deserved a chapter of their own. The chapter’s main achievement is to ensure the wider consequences of AIDS are acknowledged to the atlas’ medical readership and – as the editors write themselves – to instill an appreciation of the immense contribution made by those affected most by the epidemic. It could be seen as a ‘red-ribbon’ chapter, pinning a message of compassion to the medical definition of AIDS, which pays respect to the historical legacy of activism and patient movements. Indeed, the chapter concludes with a somewhat kitsch image of that red ribbon pinned to a doctor’s white coat adjacent to a stethoscope. Peter Staley’s invitation from 1990 had finally been taken seriously: doctors were AIDS activists too. And in 2008 as in 1990, it remained critical to challenge together the silence of those who continued their negligence to the spiralling crisis. However, this inclusion of AIDS activism in a biomedical handbook also managed to ‘medicalise’ and sanitise an activist history that defined itself at a distance to medicine. The chapter insists on seamless integration of this history with the clinical, epidemiological and microbiological details about HIV and AIDS. The chapter’s posters, images of resistance and intimate portrayals of mourning appear as just another dimension to the epidemic’s past. This inclusion of AIDS activism within clinical reference material touches on an issue that emerges every year with World AIDS Day: how to remember the activist-history of the epidemic? Surely, we should still resist relegating the symbolic spectacles, political accomplishments and lasting global impact of AIDS activism into the museum of a resolved crises. But almost any writing about this topic on a day of international commemoration grapples with the conflict of writing about a history that is not quite over. 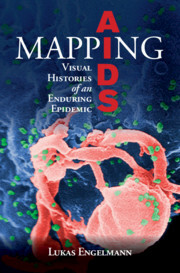 My book, Mapping AIDS, is about the pictures, maps and models that taught doctors how to see AIDS. It is also about the way pictures convey a different sense of the history of AIDS. Clinical photographs that show patients’ symptoms associated with the outbreak of AIDS belong to the crisis years and the early days when it was not clear what kinds of manifestations could be categorized as AIDS-related illnesses. Second come epidemiological maps re-tracing how HIV traveled across continents long before the condition emerged in the United States. Then finally, electron micrographs and models of the virus are strangely removed from the bodies and territories it ravaged and keep their distance from worldly timescales. Beyond these three types of AIDS pictures, images of activism do not sit well within the biomedical triptych that I discuss in my book. They resist, as enduringly uneasy representations.